Presenting the 2017 NorBay winners. The polls have closed and the readers have spoken. Here's the full list of the 2017 NorBay winners. Bohemian arts editor Charlie Swanson presented the awards Aug. 16 at Santa Rosa's Courthouse Square Plaza's excellent Wednesday Night Market. The Dylan Black Project Soulful band of veteran musicians is a fixture at community concerts and gets the crowds moving with up-tempo rhythms and scorching solos. thedylanblackproject.com. Ammo Box New Southern rock and country outfit featuring members of Bay Area party band Notorious is already making noise on the scene. ammoboxband.com. The Rhythm Rangers Led by songwriter and multi-instrumentalist Kevin Russell, the Rhythm Rangers perform timeless and laid-back Americana musings that never fail to please. kevinrussellmusic.com. Oddjob Ensemble Accordionist Kalei Yamanoha leads this Vaudevillian string band and produces an eclectic array of traditional folk. oddjobensemble.com. Charley Peach Vocalist Kaylene Harry's powerful pipes front this hard-hitting and recently revamped power-rock outfit out of Santa Rosa (pictured). charleypeachband.com. Master of ceremonies and Bohemian arts editor Charlie Swanson. Above Average Young and high-rising MC writes raps and plays video games, matching his lightning quick hand-eye coordination with a silver tongue that's steadily maturing. soundcloud.com/aboveraps. The Soul Section The eight-piece rhythm and blues revue boasts a veteran core of players who draw from influences like Otis Redding and the Meters. thesoulsection.com. Cabbagehead We recently caught up with the improvisational sextet and fell in love with their spontaneous energy and advanced musicianship. Now is the perfect time to get in the cabbage patch for yourself. cabbageheadmusic.com. The Highway Poets The North Bay's longtime favorite DIY band has been hard at work on their new album, Chasing Youth, slated for release next month. highwaypoetsmusic.com. Sol Horizon North Bay purveyors of roots reggae and world music are favorites at local festivals and beyond. solhorizon.com. One Armed Joey There's a melodic quality to Petaluma punks One Armed Joey that calls to mind '80s bands like NOFX in the best way—fun, fast, catchy and cool. onearmedjoey.bandcamp.com. 2 Minutes to Midnight Summoning the power of Iron Maiden, this tribute act has the chops it takes to rock like the British metal heads they emulate. facebook.com/pg/norcalmaiden707. Eki Shola The synthesized sounds of solo pianist and performer Eki Shola is influenced by her world travels and shares a spiritually connected message. ekishola.com. Nate Lopez The instrumental solo guitarist makes the most of his eight-string guitar for dynamic melodies and inviting atmospheres. natelopez.com. Dave Hamilton Hamilton has been playing music for nearly 40 years in the North Bay, perfecting an award-winning mix of folk and Americana. davehamiltonfolkamericana.com. Joshua Bluegreen-Cripps Musician, event producer and DJ, Joshua Bluegreen-Cripps does it all—and does it with a passion for local projects. partyevententertainment.com. Bill Bowker Longtime North Bay radio host is a champion of the blues and the arts both on-air at the Krush and in real life, co-organizing the Sonoma County Blues Festival. krsh.com. Tuesday Open Mic at Brew The weekly gathering of musicians, poets, comedians and others that join in the open mic at Brew is quickly gaining momentum. brewcoffeeandbeer.com. 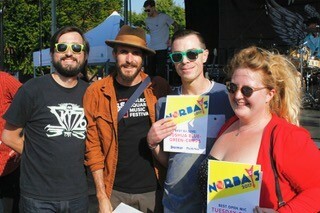 Charlie Swanson, left, mugs with NorBay winners Joshua Windmiller, Joshua Bluegreen-Cripps and Isabelle Garson. HopMonk Tavern With three North Bay locations, the HopMonk Tavern's family of venues can't be beat for outdoor entertainment. hopmonk.com. Josh Windmiller The founder of North Bay Hootenanny is once again recognized for producing events and showcasing local music in projects like the new Out There Tapes compilation featuring over a dozen bands from the North Bay. northbayhootenanny.com. Railroad Square Music Festival Not even a downpour of hail (in June!) could take the fun out of this popular summer event in Santa Rosa's lively railroad square. railroadsquaremusicfestival.com. North Bay Music Awards: Success!